From digital analysis of Bach sonatas to mining data from crowdsourced compositions, researchers at the University of Michigan are using modern big data techniques to transform how we understand, create and interact with music. Four U-M research teams will receive support for projects that apply data science tools like machine learning and data mining to the study of music theory, performance, social media-based music making, and the connection between words and music. The funding is provided under the Data Science for Music Challenge Initiative through the Michigan Institute for Data Science (MIDAS). The four projects represent the beginning of MIDAS’ support for the emerging Data Science for Music research. The long-term goal is to build a critical mass of interdisciplinary researchers for sustained development of this research area, which demonstrates the power of data science to transform traditional research disciplines. Summary: The project will develop a platform for crowdsourced music making and performance, and use data mining techniques to discover patterns in audience engagement and participation. The results can be applied to other interactive settings as well, including developing new educational tools. Summary: The project will develop and analyze a library of digitized performances of Bach’s Trio Sonatas, applying novel algorithms to study the music structure from a data science perspective. The team’s analysis will compare different performances to determine features that make performances artistic, as well as the common mistakes performers make. Findings will be integrated into courses both on organ performance and on data science. Summary: The project will develop a data science framework that will connect language and music, developing tools that can produce musical interpretations of texts based on content and emotion. The resulting tool will be able to translate any text—poetry, prose, or even research papers—into music. Summary: This project will combine music theory and computational analysis to compare the melodies of music across six cultures—including Indian and Irish songs, as well as Bach and Mozart—to identify commonalities in how music is structured cross-culturally. 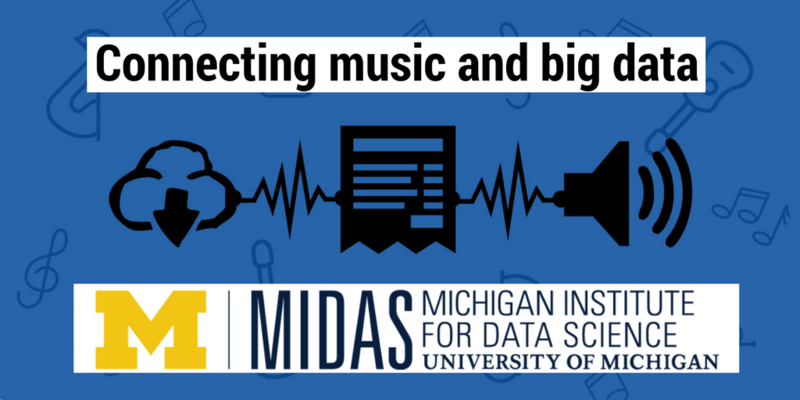 The Data Science for Music program is the fifth challenge initiative funded by MIDAS to promote innovation in data science and cross-disciplinary collaboration, while building on existing expertise of U-M researchers. The other four are focused on transportation, health sciences, social sciences and learning analytics. Hero said the confluence of music and data science was a natural extension. “The University of Michigan’s combined strengths in data science methodology and music makes us an ideal crucible for discovery and innovation at this intersection,” he said.